Here is an onboard LED in the expansion shield, it is connected to digital pin 13. ‘D’: stands for digital signal, which should be connected to digital pins. ‘A’: stands for analog signal, which should be connected to analog pins. 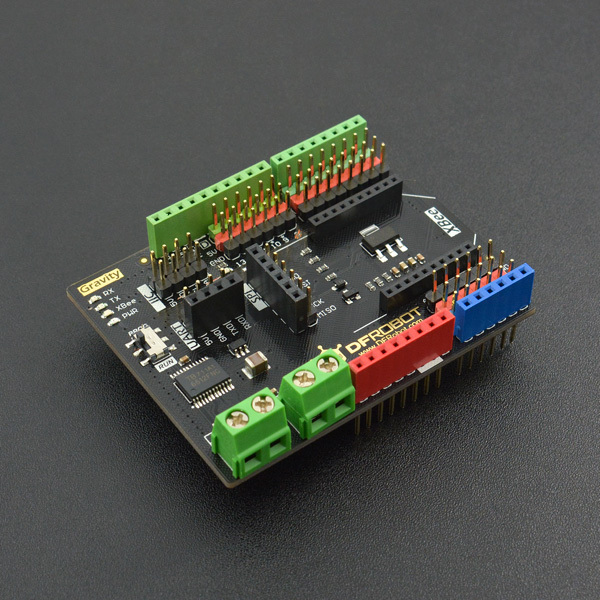 Gravity: IO Expansion & Motor Driver Shield V1.0 is sufficient in interfaces. Compared to limited power supply interfaces in the control shields, it equipped with more GND interfaces and power supply interfaces. Although a multi-sensors connection, no need to worry about interface shortage. A row of red pins and a row of black pins are below digital pins and analog pin. They are the expanding power supply interface. The red pins connect to the power supply (VCC) and the black pins connect to GND. The reason why designed the order as Signal > VCC > GND is to correspond to sensors linear order, the design has improved the wiring efficiency. The new expansion shield added switch ‘RUN’ and ‘Download’. When using controller such as Arduino UNO/ Mega, you may failed to download program because downloading and XBee would occupy the same serial port. Therefore, you should switch to ‘PROG’ in download and switch to ‘RUN’ in run. * brief Show Show The motor turns clockwise or counterclockwise. The motor rotate slowly in clockwise for 5s and rotate quickly in counter-clockwise for 5s and goes on. NOTE: If the motor rotating direction is opposite to the expectation, you just need to adjust the pin order. 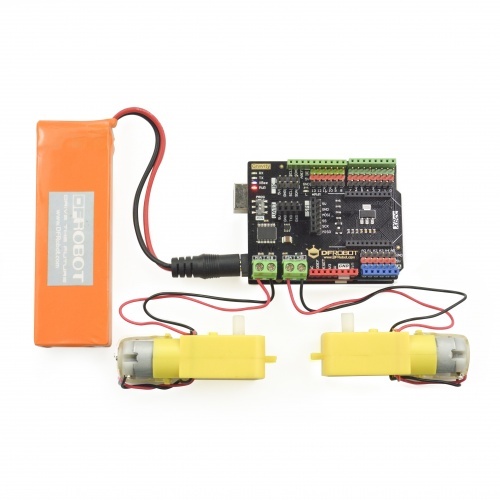 Get Gravity: IO Expansion & Motor Driver Shield from DFRobot Store or DFRobot Distributor.